Originally from Lowell, Massachusetts. Began music lessons in 1949 on accordion and plays piano, organ, drums and some clarinet. Played first “job” in 1954 with the Johnny Pudlo orchestra (Lowell, MA) filling in for her accordion teacher. Founder of the Polkateens an all teenage group (Lowell, MA), and remained until 1959. Played drums for the all girl orchestra The Polkarettes (Lowell, MA) from 1959-1962 and again form 1965-1971. After holding many secretarial, administrative and managerial positions as a federal employee with the United States Air Force, culminated a very successful career and retired (June 2000) after 40 years service. As Co-Leader of the band, responsible for all uniforms and the appearance of the band and the sales of recordings and promotional goods, T-Shirts, etc. Also acts as tour guide on Travel Club trips. Originally from Lowell, Massachusetts. 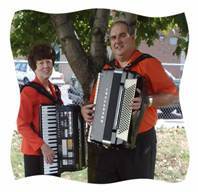 Began music lessons in 1954 on Accordion. Also plays Tenor Saxophone. In 1955 was asked by “Irene” Pare to join a band called The Polkateens. Performed with the Polkateers (Lowell, MA) 1957-1961, Kings Knights 1961-1965 (Charleston, SC/While in Military), Aristocrats (Lowell, MA), 1965-1968, Polkateers 1968-1971. Currently self employed. Owner/Manager, Unlimited Sales of NH, a commercial dealer and supplier of business forms and printing. Owner/Manager Sound-A-bouts Travel Club, an independent tour operator specializing in motor coach tours, hotel weekends, vacation trips and other events associated with the polka industry. As leader of the band, responsible for bookings & promotions, equipment & transportation, and musical selections. Began music lessons on clarinet. Also plays alto and tenor saxophone. Started playing professionally in 1956. Has performed with the Eddie Walenta Orchestra (CT), The Aristocrats (Lowell, MA) and The Ray Henry and Al Soyka orchestras. Larry is also 1st clarinetist with the Seacoast Wind Ensemble in Durham, NH. Has recorded once with the Eddie Walenta Orchestra. Larry currently resides in Newburyport, Massachusetts with his wife Florence, has a son, 2 daughters and 5 grandchildren. Larry is now retired after 35 years as an engineer with Bell Labs in No. Andover, MA, and has begun a photo restoration business at home. Been With The Sound-A-bouts since 1993. Susan and Bob are now on hiatus from the band taking a break from their musical careers to spend time with their family. been with the Sound-A-bouts full time since October 2000.